Has enough attention been paid to avoid the risks of governing and managing a programme in isolation from business as usual, particularly when important resources are shared between a programme and business as usual? Have the main points been identified where the programme environment and governance demands might change? Is there a schedule for reviewing the governance arrangements at those points? Is there enough and effective critical challenge in the governance arrangements, including enough independent participation? Have the main strategic risks to the programme been identified? Is there a degree of independence in identifying and managing the risks? Is there continuous planning, reviewing, reporting, and updating of the benefits being and to be realised over the full life of the programme? Have the points in the programme’s life been identified where information will be available to communicate with each main stakeholder? Has deliberate thought been given to making the most of the strengths of multiple organisational cultures, when a programme involves staff and external parties working together? 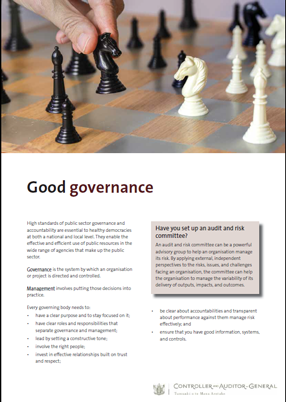 Is governance information tailored enough to the needs of governors, and is it set out to help them understand it fully in the time they have available?